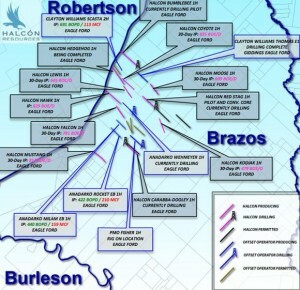 Halcon is extending the Eagle Ford north into Brazos and Robertson counties in what the company has deemed the "El Halcon" prospect. The company unveiled a 50,000 net acre position with plans to expand to 150,000 net acres in and around northern Brazos County.Early well results looking promising. The first two wells produced 859 boe/d and 694 boe/d, respectively. Both wells had a production stream that was 94% oil. The first few wells have effective lateral lengths of 5,632 ft and were completed with 28 frac stages. Halcon estimates each well will recover 350,000-400,000 boe at a cost of $7-8 million. Halcon's plans in the area are to run 1-3 rigs, with capital spending estimated at $100 million in 2013. Halcon also announced the company plans to focus its Woodbine efforts around 220,000 acres in Leon, Madison, Grimes, and Polk counties. The company has confidence in the limits of the Halliday Field and will begin to focus on operational efficiencies. The results of a 3D seismic survey in Madison, Grimes, and Walker counties should be processed by the end of 2013. The data will allow the company to plan exploration in this less proven area.